A new analysis released by the Australian Electoral Commission reports that the Property Industry has more than 1.4 million jobs in Australia. An exciting time for the Property Market, which has seen employment in the sector grow by 22% between 2013/2014 and 2015/2016. Employing more than any other sector, it has surpassed the health care and social assistance as the biggest direct contributor to employment in Australia by industry. Australia’s largest property companies have ranked first in the world in the international GRESB survey for social, environmental and governance performance on sustainably for the last seven years. Along with the analysis release is the launch of a community-facing campaign ‘Creating for Generations’ by the Property Council working with Property Industry members to tell the compelling job creation story to the industry. 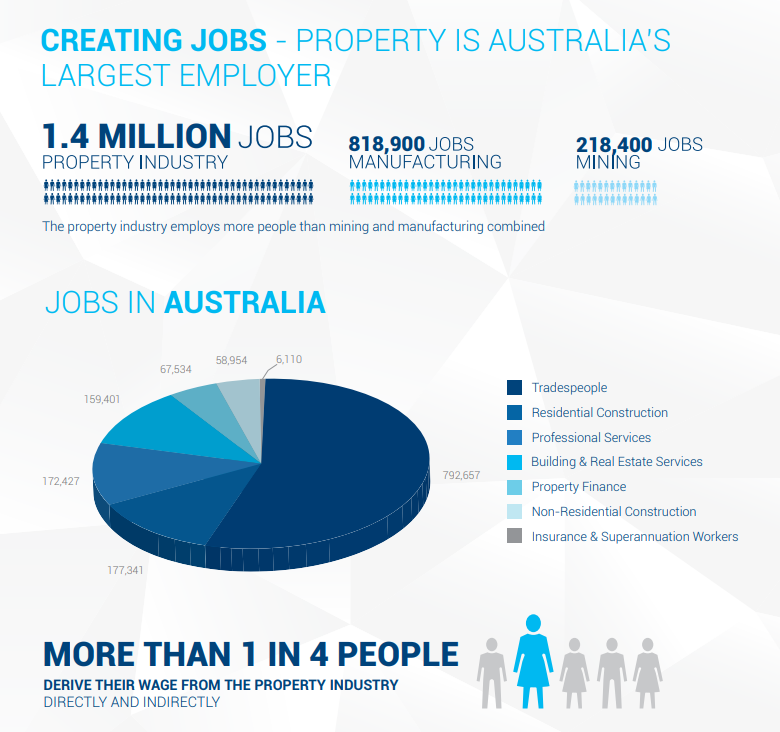 The campaign showcases the scope of the property industry as Australia’s biggest job provider and economic activity, highlighting everything from commercial to residential, retirement, retail, office and industrial. Click here to read the national report for reports on each state and territory.